SHIPPING: When books are ordered with other products, the entire order is shipped via UPS. When ONLY BOOKS are ordered, we will recalculate shipping based on USPS Media Rates which are typically much cheaper, but slower - and contact you to give you the option. IF a book is ordered with an appliance that has free shipping, then we will include the book in the same box, and NOT CHARGE shipping on the book. For instance, many customers order our Recipe Collection with a grain mill. 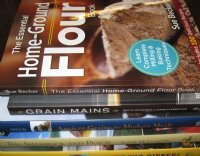 The web cart calculates UPS shipping on the book - we will delete the shipping charge for the Recipe Collection and the entire order will ship with FREE Shipping.